Salaries of US college graduates are in sharp decline! Oh, and by the way, woman still make a whole heck of a lot less than men. - It's New and Different! It's New and Different! Salaries of US college graduates are in sharp decline! Oh, and by the way, woman still make a whole heck of a lot less than men. I just read this interesting article on BoingBoing about how the average salary of college-educated US men and women are in sharp decline. There’s an accompanying article by economist Michael Mandel that asks what policymakers can do to try to reverse this downward trend. Interesting stuff. But then I took a closer look at the numbers. Wait a minute. Men’s salaries are down, sure. But they are “down” to $59,000. 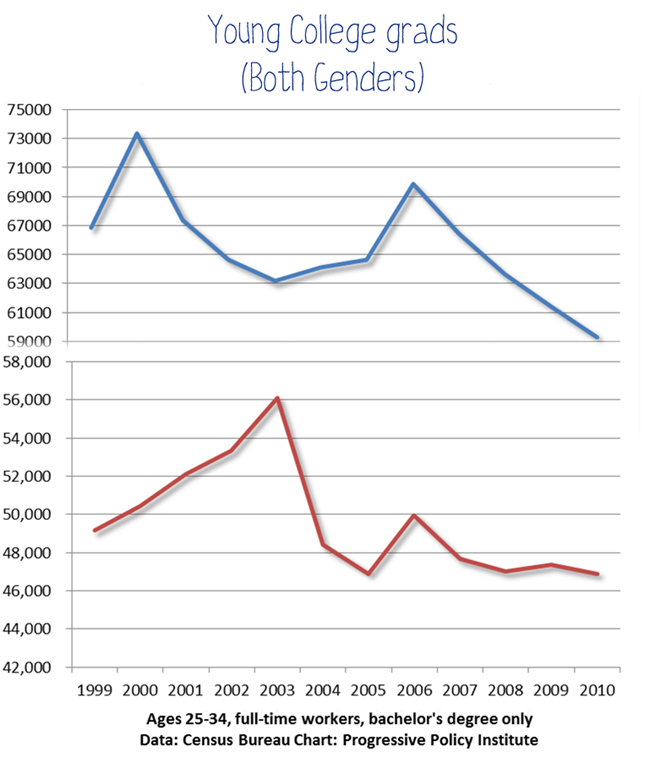 Now take a look at the graph of the female college grads. The highest average salary for a woman? Way back in 2003…topping out at $58,000. Yup. At our most lucrative time in history, ladies, we were still making $1,000 less than the lowest average salary for men in the last 10 years. This is a particularly striking example of how poor data visualization can completely obscure a huge pattern in the data. By putting the graphs side by side, we assume that they line up. But in this case, they definitely don’t. Let’s take a look at them on the same scale. This is just a quick and dirty mock-up, but I think you get the picture. Now here’s, MY question, policymakers…what can you do about this? Spook on November 12, 2011 at 10:11 pm. It would appear that the solution to this problem is to encourage more women to pursue careers in science and technology. Event Horizon on November 13, 2011 at 4:36 pm. I wonder if a career in science or technology is worth it when corporations will simply offshore the work or whine (with both hands over their eyes) that they “just can’t find anyone qualified” and “please, please raise the H1B visa cap.” FYI, the trend I’ve experienced with information technology (in spite of being ‘current’) is that your salary is cut in half about every ten years. Karen on November 16, 2011 at 9:47 am. Decades ago a friend, who is a nurse, told me she was really happy that men were becoming nurses. Her reasoning was that with men entering the field, the profession of nursing would gain greater prestige (would no longer be merely “woman’s work”) and, thus, salaries would go up. She was right. Of course, the opposite is also true: When women enter previously male-dominated professions (such as secretarial), salaries go down. 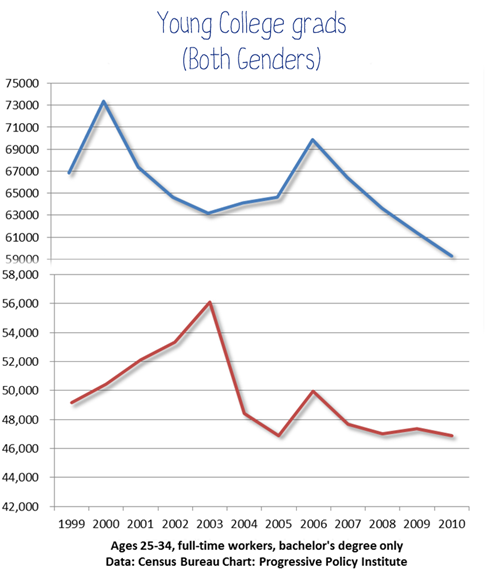 So I am not surprised that with more women getting college degrees, the value of a college degree is going down.